I've been sick so long I can't remember when it started. First it was a cold, then it became a sinus infection (which I still have). Needless to say I haven't gotten too much done in a while. Somewhere in the first week of sickness my dishwasher died so we pulled out the paper products until a new one can be delivered (expected delivery the 4th of November). I decided I am the reason I'm not getting better so I dubbed this "The Week of the NO!" Since getting sick I have made two families meals, and done far more than I should, so I decided this week I was completely focusing on resting, healing and feeling better. So Sunday when the Ward Chilli Cookoff sign up went around I didn't even look at it! I just passed it on (along with the other sign-ups that were handed around... I didn't even read the cause). It's been so hard to not DO much. Like closing my eyes and not noticing all the toys piling up in the Living room. But I'm feeling a lot better than last week and hope to be 100% better by the end of the weekend. 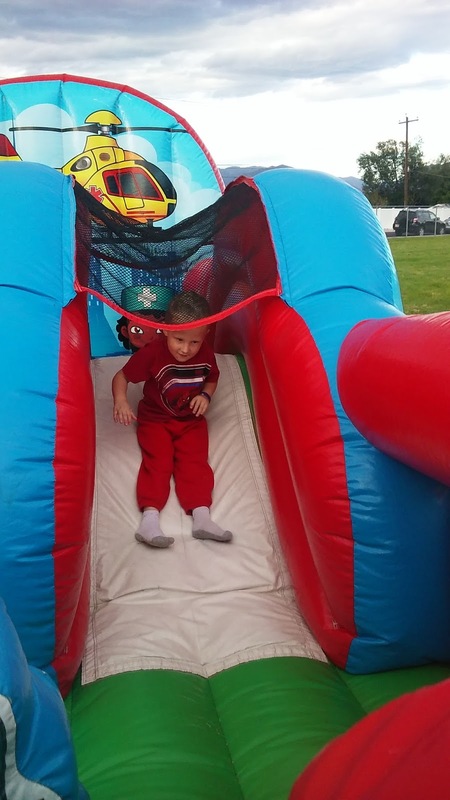 Last week Logan had Fall Break so we tried really hard to do fun things! We went to the Library to pick out new books and movies for the weekend. The kids are working on a Library program where they need to read a certain amount of books to qualify for a free book, so they requested us go here! 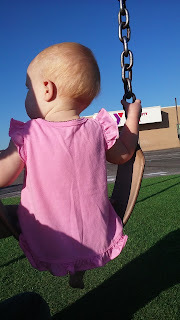 We also hit up the Zipline Park and made several trips to the park across the street. We had a few coupons for free kids meals at Del Taco left over from our summer reading program rewards so we hit them up too. The kids loved their quesadillas and the play place! Saturday included the Plastow family Halloween Party at Jon & Anisa's house and the kids had fun playing with their cousins. We also had a surprise home inspection Saturday morning. I guess we have reached 20% of the value of our home payed off toward the Mortgage company so they need to make sure the value of the house is still at least where it was when we took out the loan and then they can remove our Mortgage Insurance. So it's a good thing, but I wasn't too happy when they called to schedule it on Friday. I requested they come out the following week but was told it "needed to be done within 24 hours". Sounds like crap to me, but we cleaned like mad to make sure it looked nice for them to take pictures. This week was also a short week for Logan (half day of school Thursday and no school Friday). It's been beautiful out weather wise (between 60 and 70) so we've tried to play outside at least once a day. Sometimes more just happened. 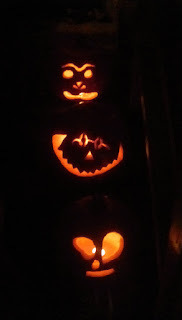 We also carved pumpkins last night, realizing Halloween is less than a week away. Since Dave had texted saying he was getting sick too the boys and I hollowed out the pumpkins during the day so at night we would just have the fun part left. 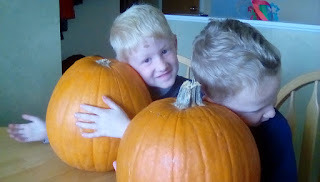 The boys were convinced they could hear the ocean in their hollowed out pumpkins! They spent about 30 minutes listening to them in wonder. Dave designed the top one for Brooklyn, Logan drew the middle one, and Dustin drew the bottom one. All turned out great and we love seeing them glow! Other than that my friend Tenille came to visit us briefly this week. She's had me on a hunt for antique sewing machines and she was just itching to get her hands on her new machine! She bought two for herself and I ended up buying one for my Mom. So in the course of a week I've bought 3 antique sewing machines not for myself. All are Singers, and they were all killer deals. A few weeks ago Logan's school had a Carnaval! 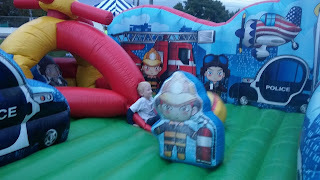 The boys had a blast playing in the bounce houses with Logan's friends. They were all over the place and thoroughly wore themselves out! Brooklyn had a good time watching the boys, but wasn't quite big enough for the festivities yet. She did enjoy the swing, which is one of her favorite things to do in general. It was a fun event and we let the boys pick a treat while there. Logan got a snow cone and Dustin got a thing of Cotton candy. Dave and I obtained from the sugary goodness. Last weekend was Conference! We loved listening to the Apostles speak. There was much snacking, much snuggling and much sewing. I have to keep my hands busy or I fall asleep during the afternoon sessions every time. My main project was appliquéing a penguin onto Brooklyn's stocking. 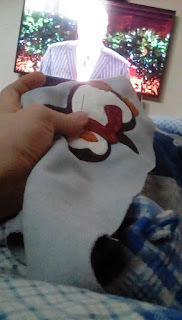 It's not done yet, but the applique part is finished (which is by far the longest to complete). 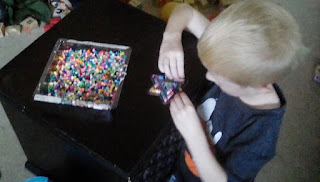 Logan spent the vast majority of Sunday making Perler bead creations. He made designs, super heroes and a skull for our neighbor. Don't be surprised if you get a creation for Christmas. 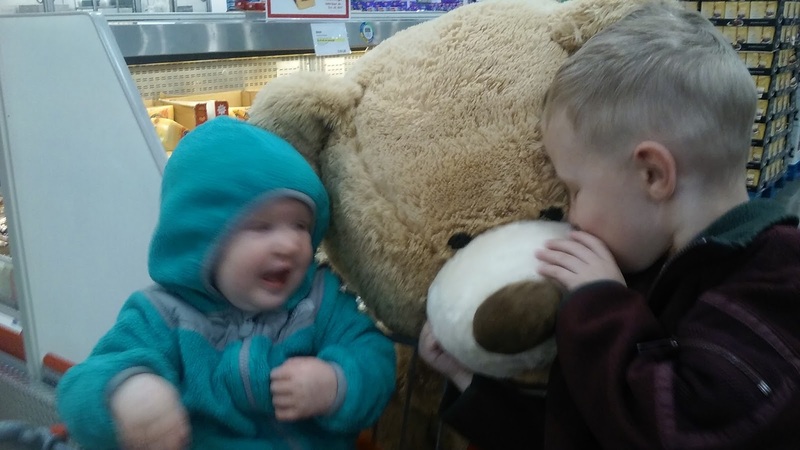 This is the oversized bear we have to snuggle with every time we are at Costco. He comes up to my chin he is so huge. 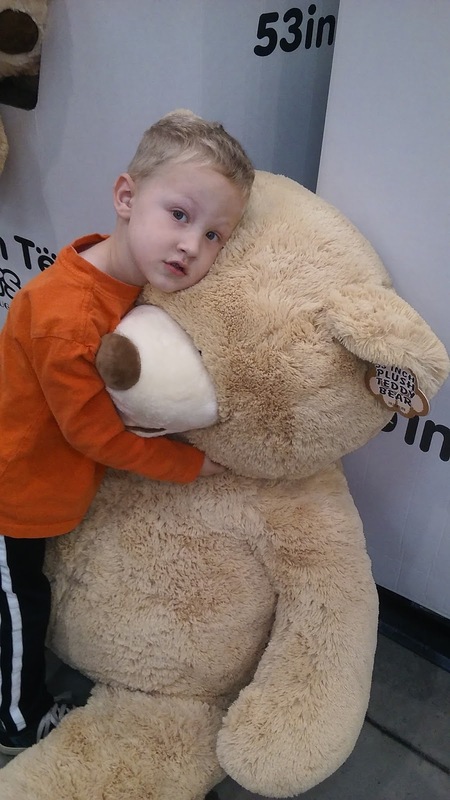 We have to take a picture of him every time we are at Costco and text it to someone BEGGING for it for Dustin's Birthday, Christmas, or "because you love me". Finally Grandma Sheila and Papa Mike said to buy it for Dustin's Birthday! He doesn't know yet... We "bought" it for Grandma & Papa and it disappeared the next day. It will reappear again in a month. 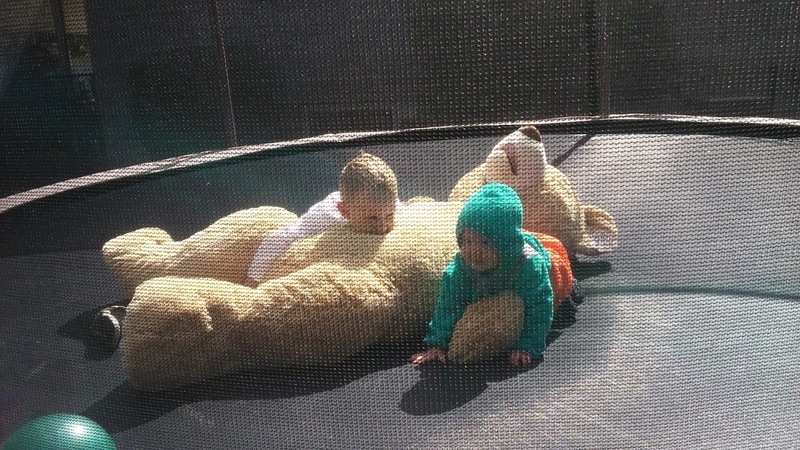 This is Dustin's second massively oversized animal. 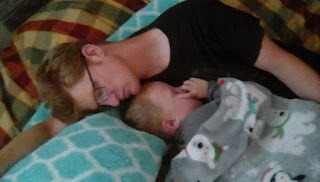 We snuggle his Giraffe Peachy every day and read our scriptures and bedtime stories leaning against him in the boys room. He promises to share with his sibblings if he could just have one! Last weekend we went canoeing with Mike and Alison for Sara's birthday bash! We inherited the canoe the Poulson's had when they were kids and Mike inherited the canoe our family had. Halfway down the river we stopped for watermelon and birthday cake. It was tons of fun! But we all had a good time! Brooklyn kept trying to go swimming. She loved feeling the water and Dustin loved splashing her while Logan loved telling us what we saw on river. After we chatted while the kids played in the canoes. It was a good time. Logan was happy to find out we were making our own pizzas for dinner that night too. It's one of our family's favorite meals, and will probably be happening more frequently since I made packets of pizza dough mix. Other than that our lives have been consumed with selling candybars for Logan's school fundraiser. He set a goal to sell 96 bars which will earn him a prize of a magic thumb trick. I seriously considered buying him the prize so I didn't have to worry about the fundraiser, but he was so gung-ho that I gave in and we went door to door to ward members in the neighborhood. He had sold the entire two boxes by day two of the two week event! We've also been reading chapter books lately for bedtime stories. Logan picked Tales of the 4th Grade Nothing (which we have completed) and Dustin picked Castle in the Attic (which we are still working on)..